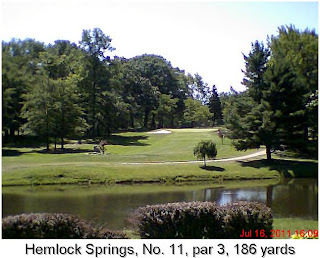 As solid values go in local golf courses, they don't come any more solid than a $20 weekday round at Hemlock Springs. We're talking a whole lot of golf for not much green. Owner and general manager Greg Maruna formerly charged more for a round at the challenging, eye-pleasing track in Harpersfield Township. I know from recent conversations with Greg he wishes he could charge more. But in this economy, you set your greens fees at what the market bears or your tee box turns into a ghost town. Geography has something to do with the ultra-reasonable. It's a bit of a poke to Hemlock Springs. The same as all good public course owners, Maruna is a keen observer of the license lates on the vehicles in his parking lot. He'll give you a detailed breakdown of his customers, many of whom are from Lake, Geauga and eastern Cuyahoga counties. Ashtabula County golfers have long been loyal to Hemlock Springs. From the east, Maruna draws customers from the Conneaut and Erie, Pa. areas. No matter their points of origin, Hemlock Springs patrons all appreciate the challenges, top-notch conditions and scenic beauty of the course. Friendliness is a big selling point, too. As far as I'm concerned, there isn't an "easy'' hole at Hemlock Springs. Every hole places a premium on some phase of the game. The putting surfaces are fast enough and fair. On any fair-minded list of the 18 toughest holes on public courses in Northeast Ohio, Hemlock's par-3, 186-yard 11th hole must be included. It's been 35 or so years since I first visited Hemlock Springs with my late father and some of his friends. I've posted some bad scores there and some good ones. Given the quality of this course and my fondness for it, the good scores always feel great. course is a dump - they put no money back into the place - stay away!